I would have to say that today was the best day of the year. 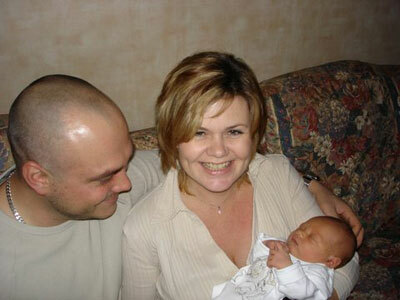 Jason and Louisa's daughter Eva was born today. So beautiful! Just think of the wonderful times she has ahead of her. 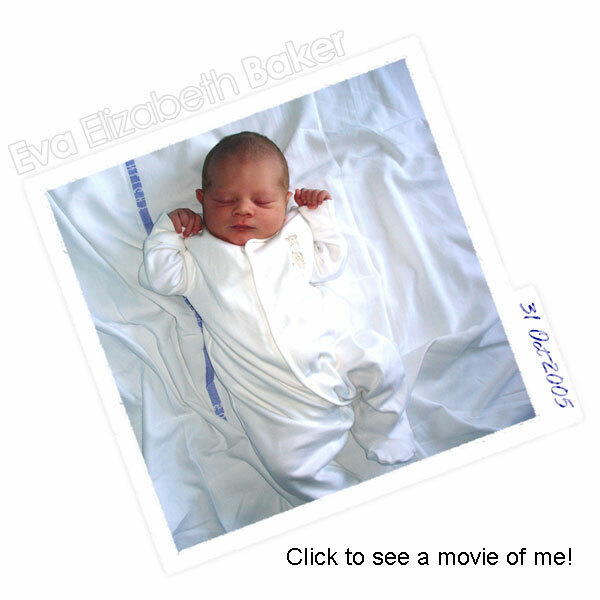 Click on the picture to see a one minute long movie of Eva 'in action' <grin>. I went out again today west of Avon/St Johns. There is a lot of nice countryside in this area. 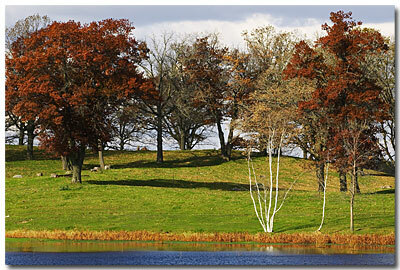 Here is a shot with a couple of oak trees. I thought it was supposed to be a cloudy rainy day today, but it was clear this morning before the cloulds started rolling in. By mid day there were just a few spots where the sun was peeking through. It lit up these trees for a minute. 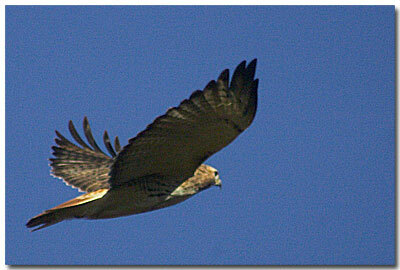 And here is another hawk picture. 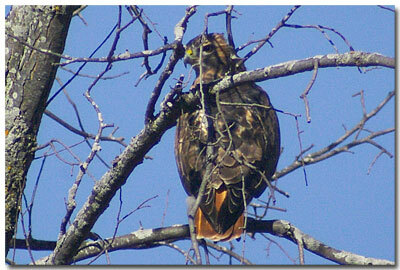 I got a little closer to this one since he was just sitting on a power line right along side the road <grin>. I'm quite a bird stalker. Then he took off on me. 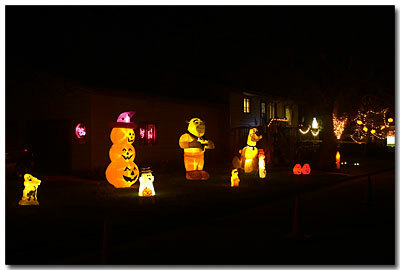 Jim and Ericka had a big Halloween party at their house tonight. Ericka really did a nice job of decorating the outside of the house. Here are a few shots I took. 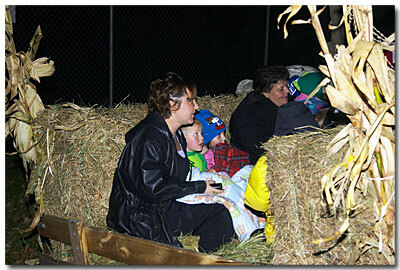 Everybody went on a hayride. I made a trip to some of the parks southwest of Minneapolis today. There were a lot of trees with very nice colors, but the countryside is much more built up and not of lot of nice overall scenery. But I'll put up a couple of shots. 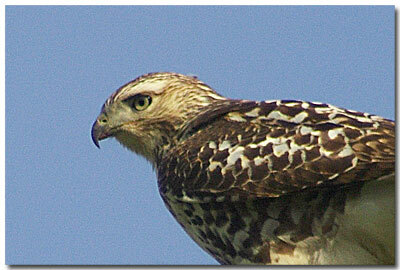 This first one is a hawk (I think it's a Redtailed Hawk) I saw near Lake Maria State Park. It was pretty big, the size of a large owl. Maybe it's passing through on it's way south. Here's another shot of him sitting in a tree. I thought I'd check out some of the State Parks in the central and east central part of the state this weekend. 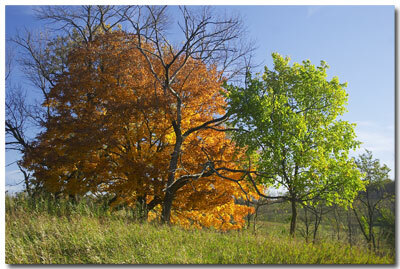 It seems the best fall color is when there are a lot of maple trees. And the northeastern part of Minnesota doesn't seem to have a lot of them. Up at Banning which is near Sandstone, there was hardly any color left, and not many maples in any case. I am working on the some of the shots I got, and some are not too bad. I'll be posting them as I get them processed tonight and tomorrow night. 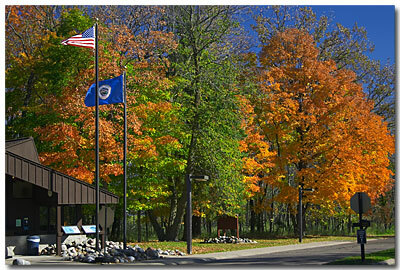 My first stop on Saturday was at Mille Lacs Kathio State Park near Onamia. 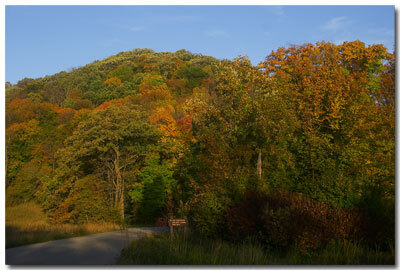 There was some nice fall color scenery on the way up and at the park. 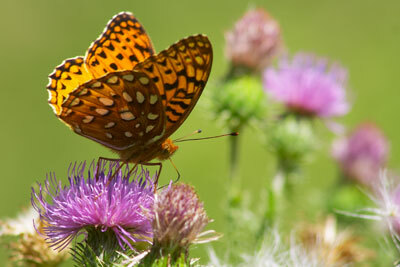 Here is a shot of one spot that was really nice. Just yellow and green here, but very nice looking. 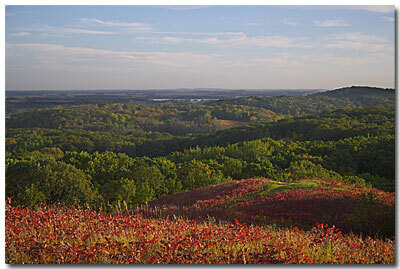 Next I went up to Father Hennepin State Park which is near Isle, MN. 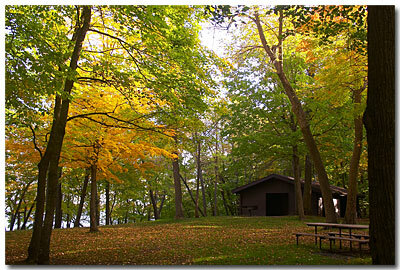 This park is located on the southeastern shore of Mille Lacs Lake. 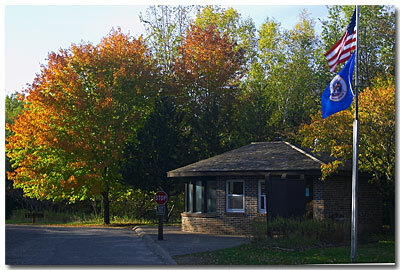 This is the park entrance. Here is a shot where you can see the lake through the trees. Here is a shot of the boat landing. 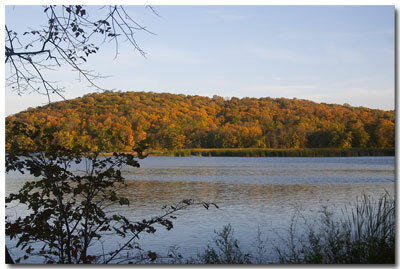 After leaving Father Hennepin I drove up to Banning State Park near Sandstone, MN. 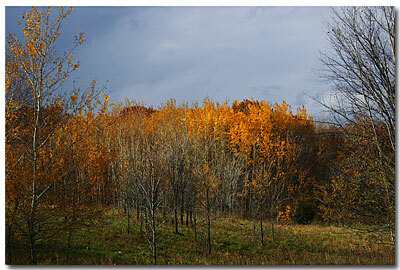 I could see on the way that the colors started to disappear the farther north I went. Banning was probably 'past peak'. 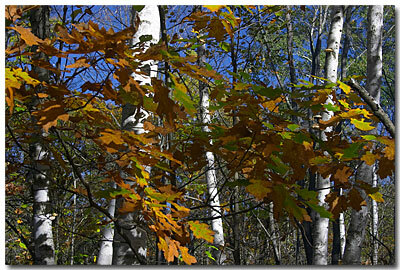 I do want to post this shot of some oak leaves that I thought looked nice against the birch trees. 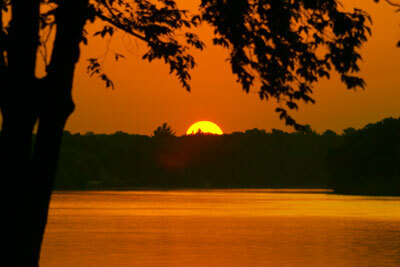 I then headed for St Croix State Park located near Hinckley, MN. 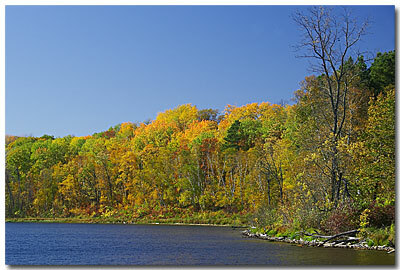 The park is on the St Croix River on the border between Minnesota and Wisconsin. On the way there I was using the GPS and was going cross country. There aren't many roads in the area and I was getting a little low on gas and a little nervous. On a gravel road in the middle of nowhere I came across this little country store with one gas pump and an elderly couple who ran it. When I pulled up the lady came out of the house. "Did you see the fawn?" she said. I didn't really know what she was talking about. 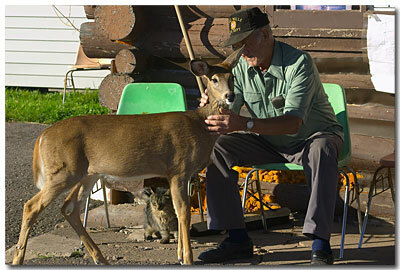 Then a few minutes later up walks this little fawn who they have been feeding all year. Her husband came up and gave me a piece of bread to feed it. It happily ate right out of my hand. 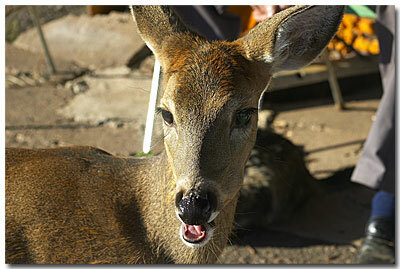 So you get to see a couple of fawn pictures <grin>. 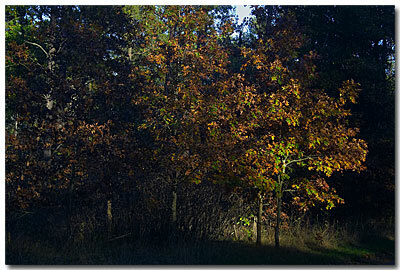 At St Croix State Park there wasn't a lot of color and it was getting near sunset. This is a shot with the sun highlighting some nice oak leaves. It is a little darkish for a 'fall color' picture. But I like it. And the mystery shot of the day. 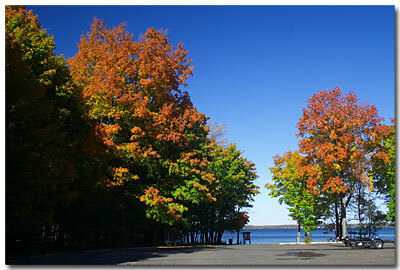 On Sunday Jim and I drove over to Lake Maria State Park near Maple Lake, MN. 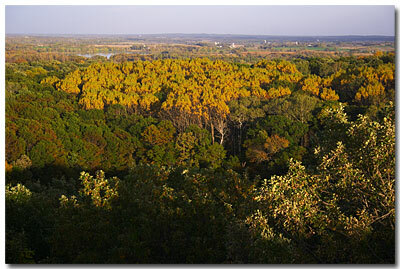 The colors were pretty bland with a lot of trees looking still green and then many with dried brown leaves. We were wondering if this was just a bad year for this area. This is a shot at the entrance. 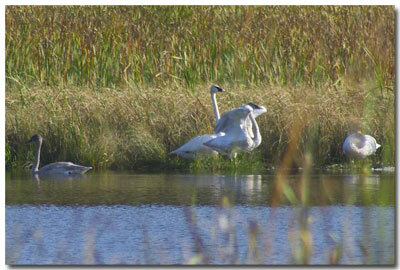 Here is a kind of fuzzy shot (they were really far away) of some Trumpeter Swans. Yesterday and today were extremely beautiful days here. Today (Sat) it was near 80ºF and hardly any clouds. I went on another 'fall leaf color' trip and if you read about the trip last week you'll know that good weather is a good thing. I took a lot of shots and will be working on posting them. For now I'll group them by each State Park. See below. 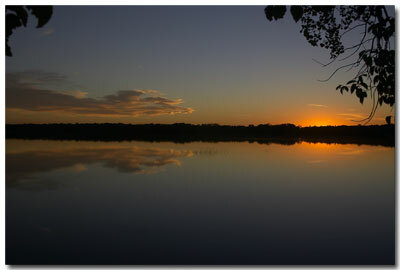 My first stop was at Lake Carlos State Park near Carlos, MN. This is a very nice park, and really not that far away. 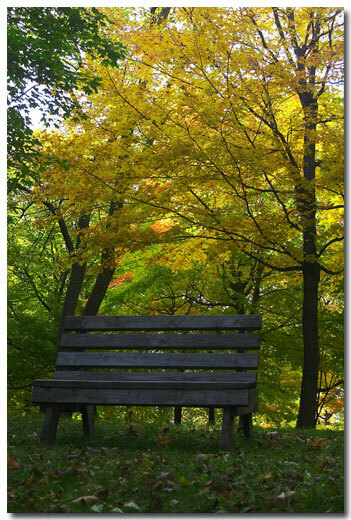 The leaves will be very nice there during the coming week and next weekend. I stopped next at Inspiration Peak near Urbank, MN. I wanted to see this spot again as it was a place we went when I was a just a little kid with my family. I remember how we would run up the hill to get to the top. Now 40 years later it seems that the hill has grown in height by several hundred feet <grin>. 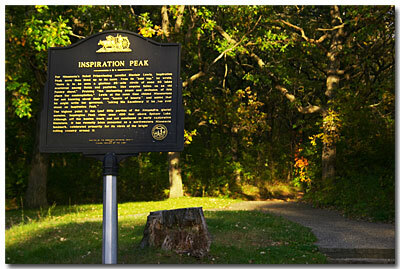 The best thing about going up to the top of Inspiration Peak is the walk back down. The next stop was Glendalough State Park. 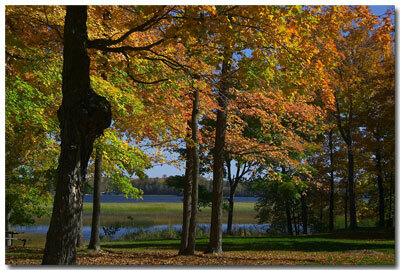 Glendalough is three miles northeast of Battle Lake, MN. I remember Mom and Dad taking us there when we were kids. I didn't get there until just before sunset so I'll have to keep it on the list to revisit during the day. From what I did see it is definitely a spot to go back to. 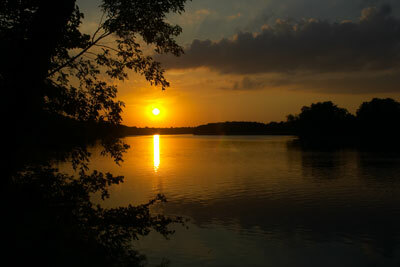 This shot is overlooking Annie Battle Lake. I stayed overnight in Pelican Rapids. 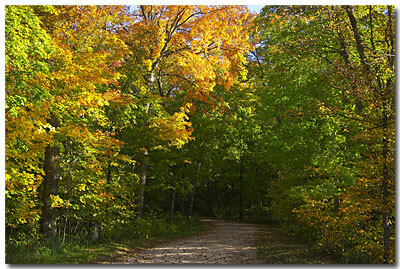 Then I headed out in the morning for Maplewood State Park which is nearby. This shot and the next were taken just after sunrise. The colors kind of blend together because of the orange color of the sunlight. The following were taken a little later in the morning. 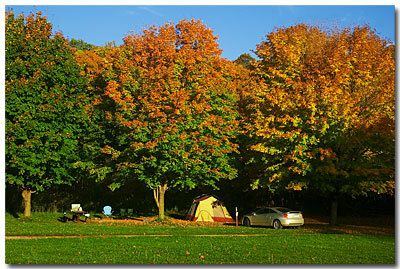 It's hard to describe how nice it was at the park early in the morning and how it made camping out look like a marvelous thing to do. It's too bad a person can't control the weather to have days like this everyday when camping out. The leaves aren't the only thing that change color in the fall. 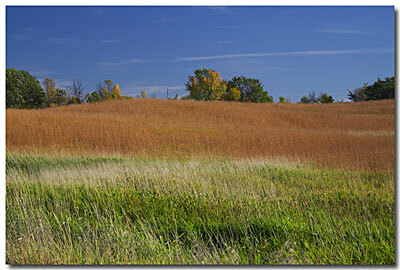 This is a shot of a hillside covered with prairie grasses. The wide spread of color looked very nice. I left Maplewood State Park around 10:30 in the morning and headed for Itasca. 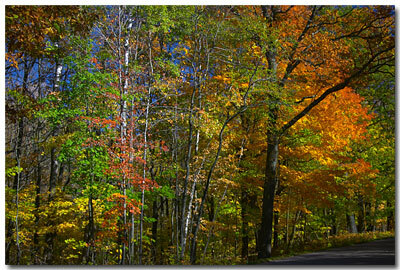 In case you might think that pretty leaves can only be found in the State Parks, here is a shot from on the road about 10 miles southwest of Park Rapids. 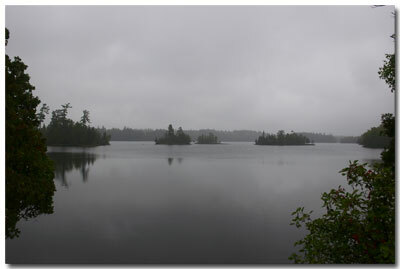 I arrived at Itasca State Park near Park Rapids, MN around noon on Saturday morning. Fall color pictures are made to be taken during the day in good sunlight it seems. 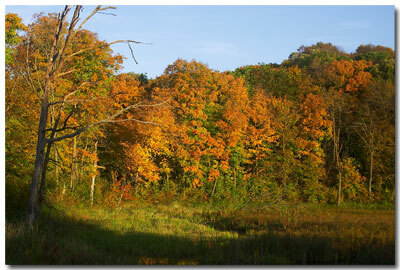 This is taken from the Wilderness trail on the west side of the park. This is also along the Wildnerness trail. A lot of people were at the park biking or driving this eight plus mile trail on the west side. These three views over the lakes can be seen from the Main Park Drive. 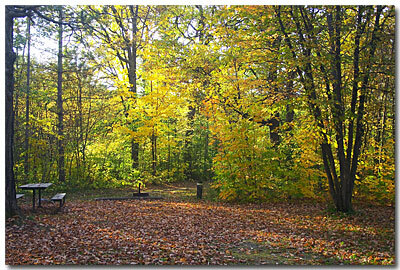 My last stop late Saturday was Charles A Lindbergh State Park in Little Falls, MN. The Mississippi side of the park was closed but I did think this shot from the park area on the east side of the road was worth posting. 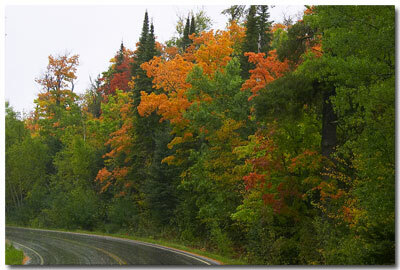 Tom and I went on a road trip this weekend with the intention of checking out the fall colors in northern Minnesota. Our intentions were good but the weather didn't cooperate very well. There was a possiblity of stopping at 13 different State Parks on our route, and we hit most of them, but not all. We started out on our trip on Friday afternoon. 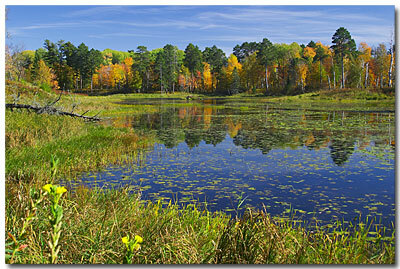 Our first stop was Itasca State Park. Here is the mandatory walking across the Mississippi photo. 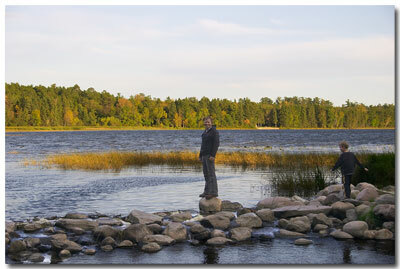 Tom is standing exactly where the Mississippi River starts, flowing north out of Lake Itasca. It was a nice afternoon weatherwise. 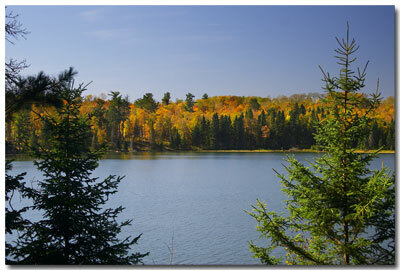 After doing our walk across the Mighty Mississippi we stopped at a trail that led down to the east side of Lake Itasca. This was just before sunset. 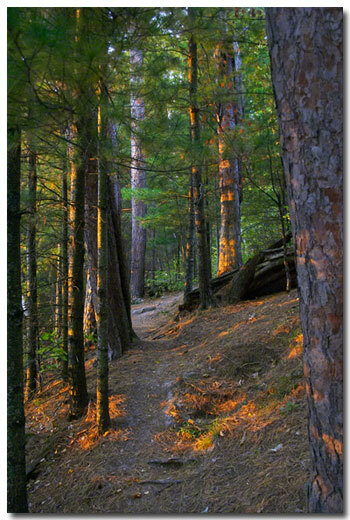 The trail looked pretty cool at that time of day. I've been working on the shots I took and it's hard to decide what to put up here. 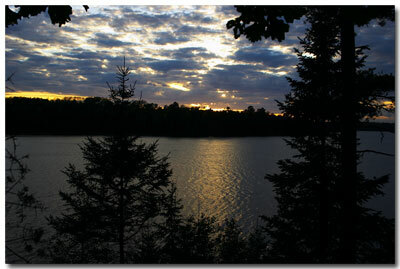 This is a shot over Lake Itasca at sunset. 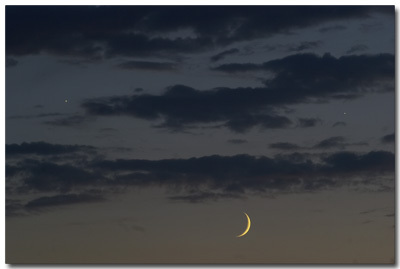 Like I said, it was a very nice day but you can see what is coming in the western sky. We stayed overnight in Bemidji. 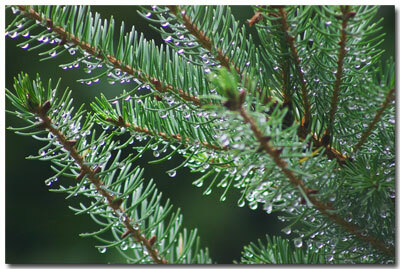 It was raining pretty heavily in the morning, but with high hopes we headed off thinking that the day might get better. Our first stop was at Lake Bemidji State Park, but it was raining so hard we didn't get any pictures. So we headed northeast toward Bigfork and Scenic State Park. Here is a shot from the road. Scenic State Park would have been very nice to check out if it hadn't been raining so hard. 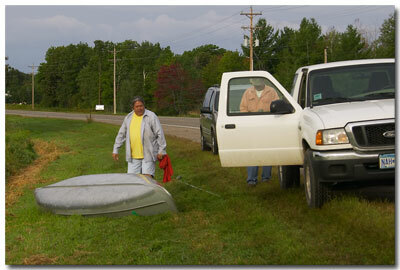 So we checked out what we could from the road and headed off for our next stop, Soudan Underground Mine State Park. 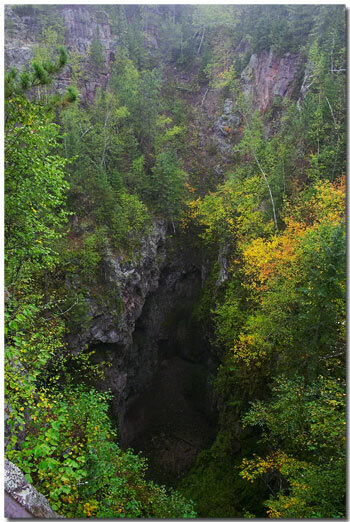 It is the oldest underground iron ore mine in Minnesota, now closed and turned into a State Park. You can take a tour 1/2 mile down underground into the mine. This is a shot of one of the open pit mines on one of the park trails. The photo doesn't do credit to how deep this looked. 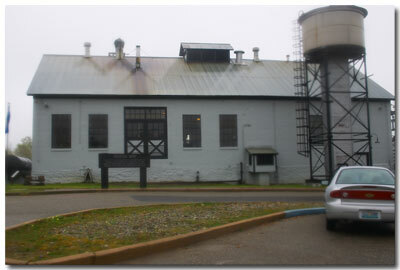 Here is a shot showing the mine building at the park. 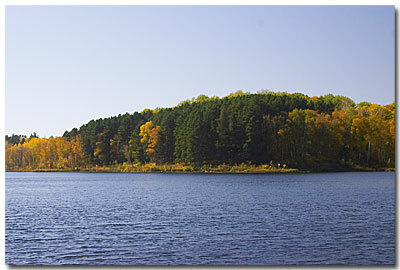 We headed next farther northeast for Bear Head Lake State Park which is located a few miles from Tower, MN. This is a really beautiful area. 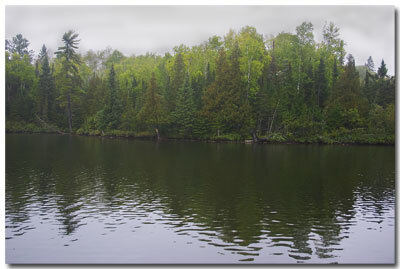 As I may have mentioned it was raining and heavily overcast, but I have to post this shot over one of the lakes just outside of the park. Tom and I both wished it was a nicer day, but this still looked nice. 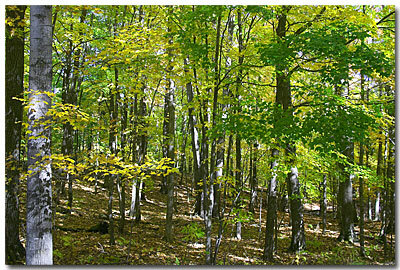 We noticed that the farther northeast we travelled we saw fewer and fewer colorful maple trees. 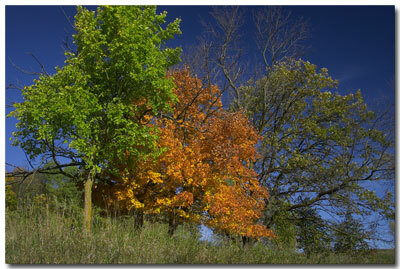 The rocky northeastern part of the state apparently doesn't have the climate to support these colorful trees. But there were many spots that we saw that could have made excellent photos on a day with a little bit of sun to work with. The stark contrast between some of the almost black-green evergreens along side the lighter shades of green and yellow looked very nice. 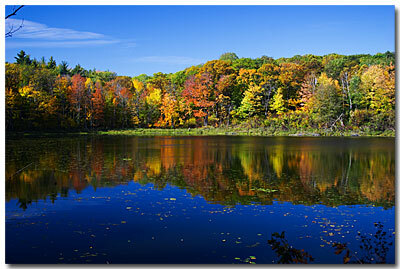 This is a shot at one of the lakes inside Bear Head Lake State Park. Not the best, but it gives a little idea of some of the colors. After we left Bear Head Lake we went into Ely to decide what to do next. It was still raining heavily and getting late in the day, but we decided to strike out for the North Shore of Lake Superior and find a place there to spend the night. Minnesota State Highway 1 runs from Ely to the North Shore near Silver Bay. 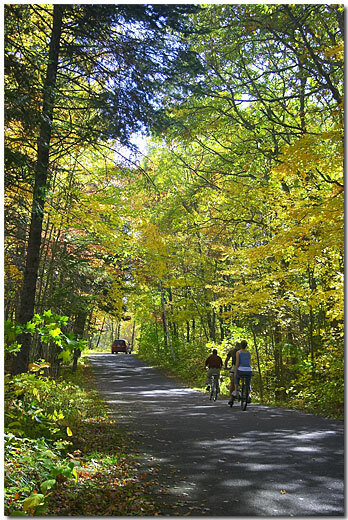 It is about a 60 mile drive that takes nearly two hours due to the twisty winding road. There are probably no more than twenty or thirty houses to see during the entire drive. In most places there are no electric lines running along the road. It was very sparsely populated. We stopped at Geaorge H Crosby-Manitou State Park. Because of the weather we didn't do any photos, and it was kind of bleak in the area anyway. 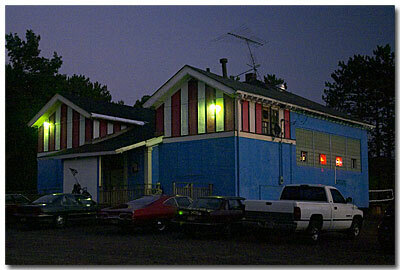 When we hit Highway 61 which runs along the North Shore we turned south to head for Silver Bay about 5 miles away. 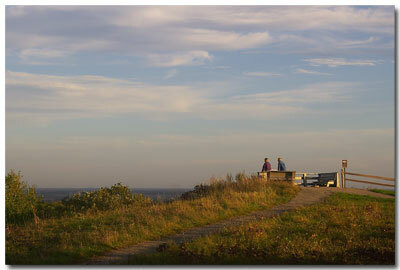 Just before you get to Silver Bay you can stop at the Palisade Head lookout over Lake Superior. Here the cliffs along the shore rise 300 feet from the water and on a clear day, people can see to the Apostle Islands about 30 miles away. Needless to say, I haven't seen the Apostle Islands yet <grin>. 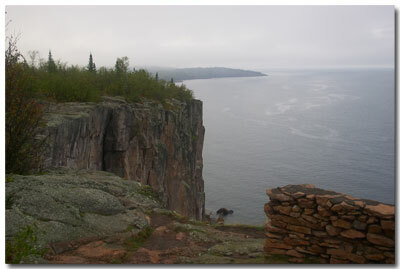 Here are a couple of rainy day shots from the top of Palisade Head. 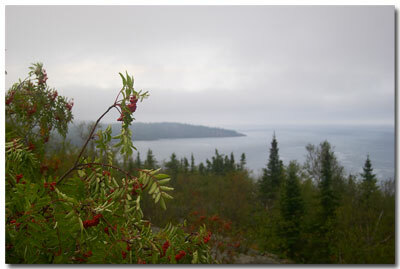 We stayed overnight in Silver Bay and in the morning headed north along the North Shore to stop at Tettegouche State Park and Temperance River State Park. 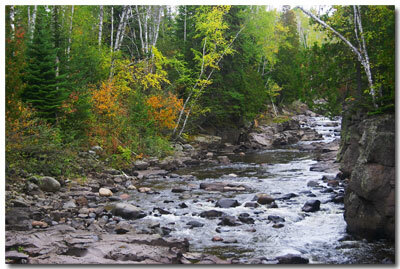 Here is a shot from Temperance River that shows what it looked like. 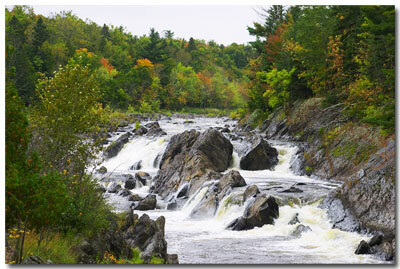 We headed back south along the North Shore on our way to Jay Cooke State Park, just south of Duluth. 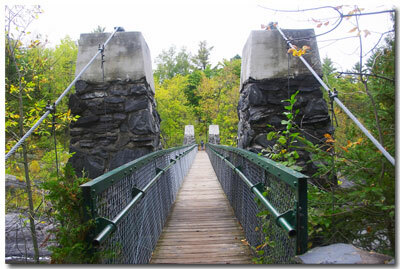 This is a very nice park and is home to the famous 'Swinging Bridge' that crosses the St Louis River. 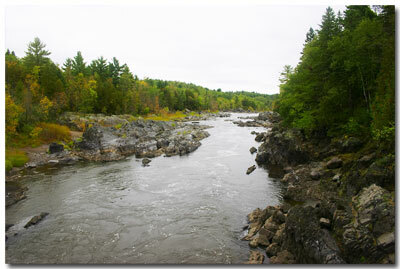 Here is a shot of the river a short hike from the far side of the bridge. And a look at the bridge itself. 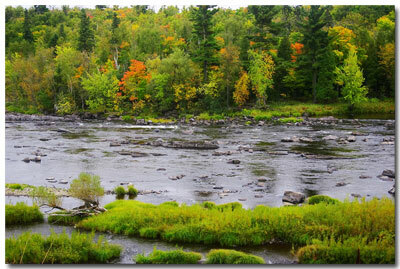 Here are two more shots overlooking the St Louis River. Tom and I both had enough of the rain this weekend. It would have been nice if the weather had been better. But then Tom pointed out how nice the evergreens trees looked and told me to take a picture. So here is the shot. We have proof of the rain now. All in all, it was a good trip. We saw things and went places we never had before. And we learned a lot about what is interesting and what is not on an adventure like this. I don't think we realize how much there is to see, and how different things can be, just a few miles from where we live. And how diverse and interesting nature can be. We'll see how the rest of this year turns out, but I realize now, more than ever, that there are many things to see and photograph. And they aren't that far away. I was walking out to the garage to get some stuff out of my camera bag when I saw this hot air balloon going by. So I had to chase it down and take some shots. 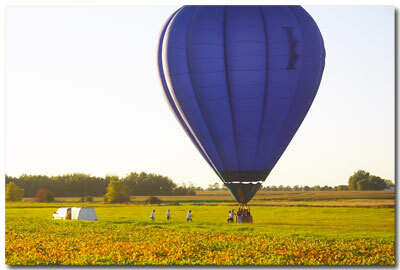 It was such a beautiful day today, perfectly clear and hardly any wind so it wasn't going too fast. I caught up with it about 3 to 4 miles out of town just as it was landing. It's funny, but the shots in the sky don't seem as nice as the ones on the ground. Too plain I guess. 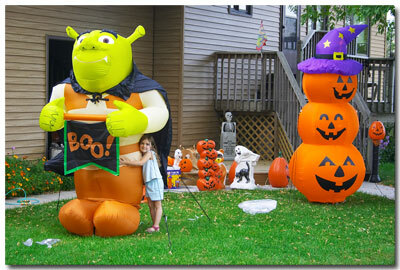 I stopped by Jim's to see what he was up to and found Erika busy putting out here Halloween decorations. She has a lot of them. Th1s shot is just the start. She said it will take here all week to get everything set up. I'll get some shots when she's done and put them up here. But for now, here is one with Savannah looking cute as usual. 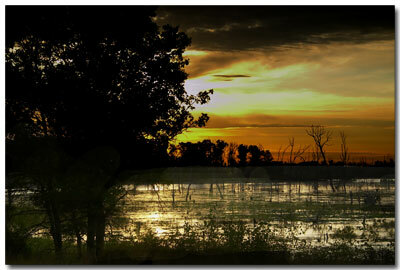 I tried another trip to Sherburne National Wildlife Refuge this morning. When I left home it was raining to the west, but the eastern sky was still somewhat clear for a little while. It was very nice. Here is another shot I thought I'd post. I'm not sure if I like this one or not????? The dead trees and swamp make it look pretty gloomy and depressing. I'll go take some happier pictures later today <grin>. 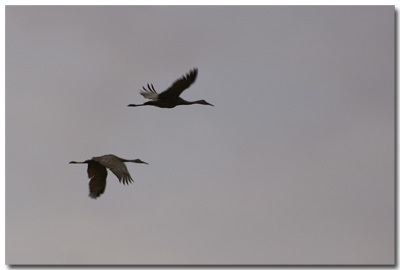 A couple of Sandhill Cranes were out cruising around. I made Jim go with me tonight to take some 'astronomy' shots. 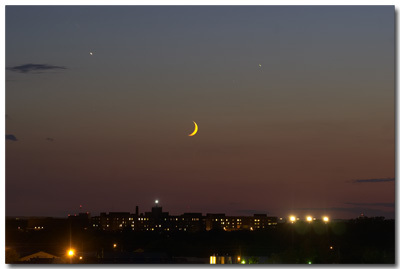 These pictures are of a conjunction of the crescent moon, Venus (upper left) and Jupiter (upper right). I was pretty happy with how these turned out. With winter coming I'm going to have to try to learn to take more 'after dark' pictures. Well, it was an interesting morning today. 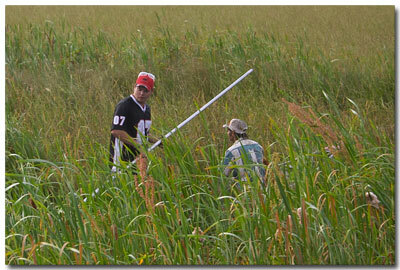 I met Lane at Royalton and we went up to Deerwood to go wild ricing. 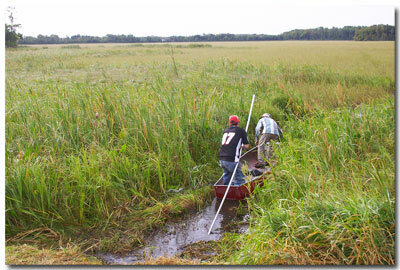 This is where you get in a tippy canoe and push yourself through a marsh while trying not to fall out. (I only fell in once. That was really fun.) Ricing is a LOT of work. Lane knows what he is doing and seems to really enjoy it. I will be determing whether or not I will be going again after I see if everything heals and if I can move in the morning. Here are a few pictures that give you somewhat of an idea of the process. Here are two more intrepid ricers that arrived. 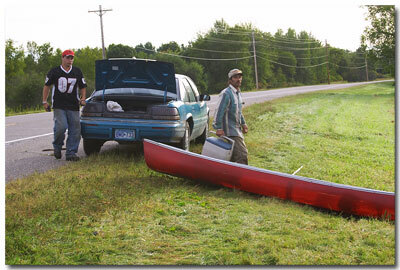 In addition to needing a canoe, a cooler with lunch is mandatory. Then off you go. If you think that this looks like it is easy or would be fun then you are wrong <grin>. This pretty much shows the technique. One guy stands in the back of the boat with a long pole (learning this bit of the fine art of ricing is how I ended up in the drink). The other guy beats the rice with two sticks so it falls into the bottom of the canoe. These guys got over 90 pounds of rice for the day. Lane and I 'harvested' a little over 60. (Lane said if I wouldn't have went in for the swim we would have had more time to collect rice.) All in all a very interesting day. (Did I mention the worms or my bleeding hands or the cold rain or the lightning bolts?) Wild horses could not drag me out again today, but next year?.... Maybe <grin>. I went to check out the Sherburne WMA again this morning. It was a totally cloudless clear morning. 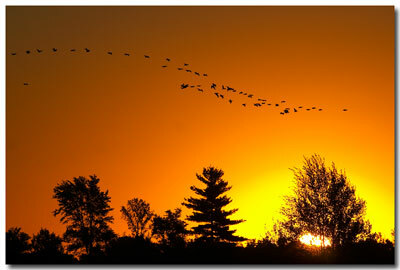 Here is one shot of some geese taking off. There were a lot of them right at sunrise. This should be an interesting spot this fall when the ducks and geese start migrating. 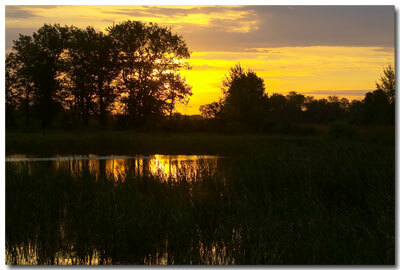 I was going to try some sunrise pictures at Little Rock Lake this morning, but ended up at the Sherburne National Wildlife Refuge. Not exactly the plan, but it was a nice trip. About the only decent sunrise shot I got follows. 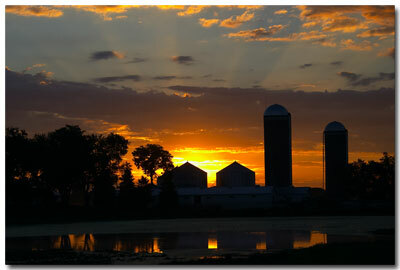 It seems I've got something for farms and farm buildings lately <grin>. 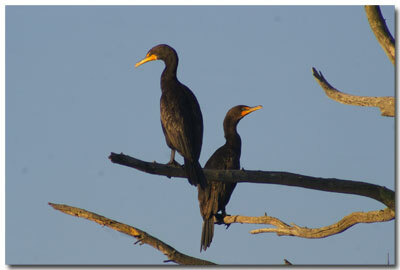 Here are a couple of Black Cormorants that were just hanging out before taking off for the day. 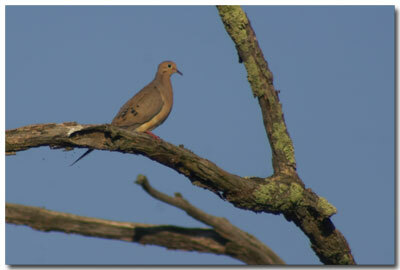 And this is about as close as I've been able to get to a Mourning Dove. They are a little skittish. 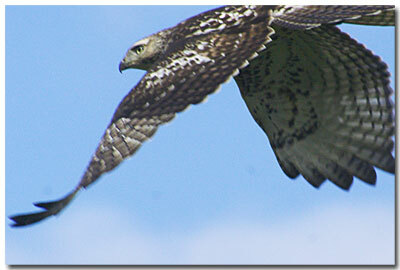 I sure am finding out that birds are hard to take pictures of without a real good lens. There are a lot of things that can be done with the computer programs that are available now. 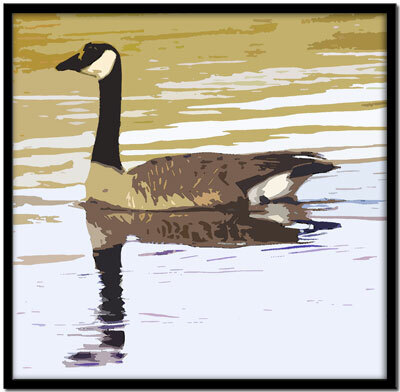 I've been testing some things with my Photoshop Elements program. Here is my first 'painting'. I wanted to do some work with photos tonight, but one of the first things I saw was the following photo of a butterfly on a purple flower (weed). I kind of liked it so here it is. The following is going to be a mix from the last few days. I let both batteries for my camera die last Friday. It's the first time that ever happened. That will teach me to be more careful in the future. Well here is something you don't see everyday. Through my considerable hunting and stalking skills I managed to track down this magnificent bull elk near St Johns Uninversity today. 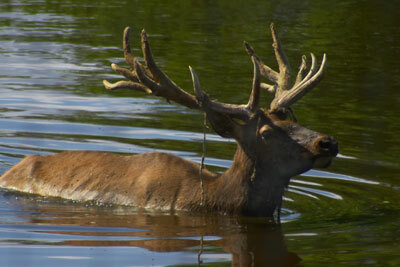 It is sure hard to get close to these big fellas. Imagine my surprise when I went to leave the area and found myself on a fenced in game reserve <grin>. This shot is one from a few days ago, but I was working on it and wanted to post it. 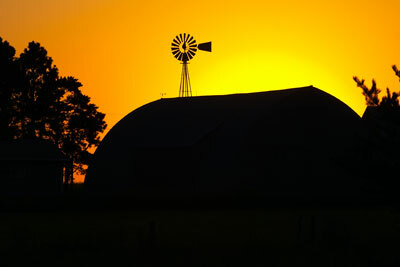 If you grew up on farm you might like it. 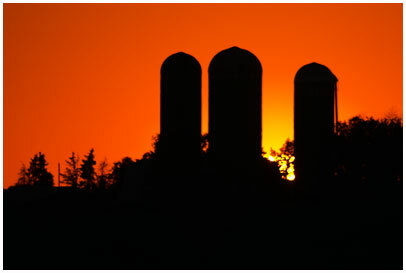 Another Minnesota hot August day. Remember how much cooler it was last summer? It must be global warming! 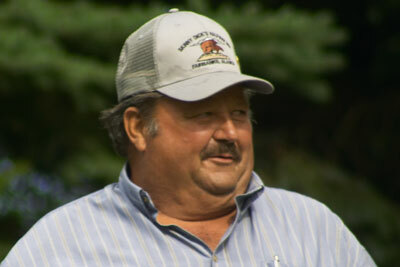 I was out at Mississippi River County Park today. I kind of like this one. The sun is a little too bright but I can't help how bright the sun is <grin>. Like I said, it was quite a hot evening, but somehow it looks cool in this shot, doesn't it? This sunset one came out kind of 'OK'. I like yellow and orange the last few days is seems. I took a trip to the Morrill area today. I was another very hot clear summer day. We sure have had a lot of them this year. No clouds in the sky. Summer is nice but each day seems to same, too much clear skies, too sunny and bright. So this is my best effort for the day.